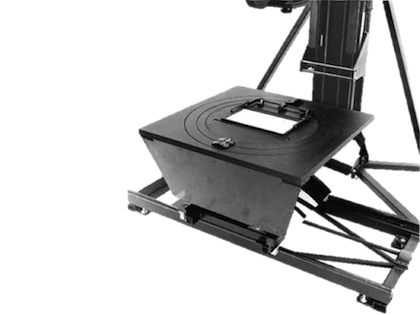 This Animation Stand is principally designed for the fast, long travel North/South - East/West moves typically needed for video applications but can easily be set up for Film cameras as well. 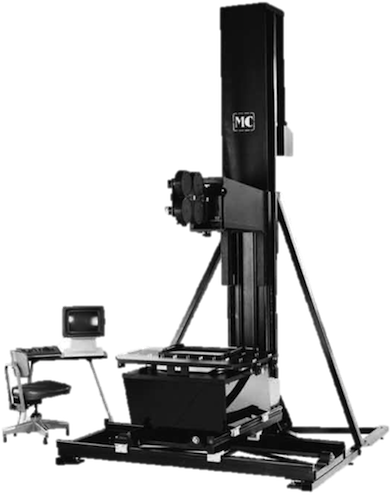 The stand has five feet of zoom axis travel, three feet of north/south travel and six feet east/west travel. 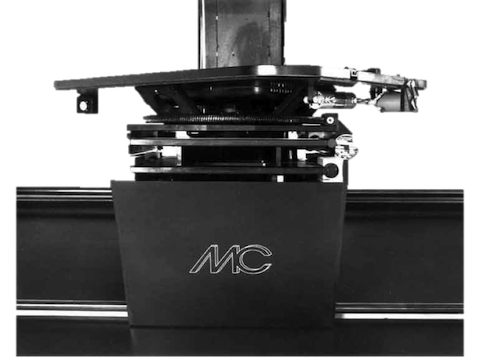 All linear axes are designed to travel at three to six feet per second with standard stepper drives (speed dependent on brand of motion control system). The standard table included with this stand is approximately 42" by 31" and has two pan bars at twelve field and two pan bars at sixteen field. 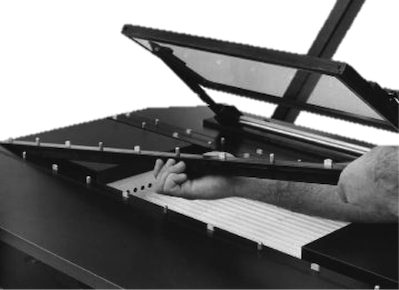 The pan bars have approximately 36" of travel and are without backlash. 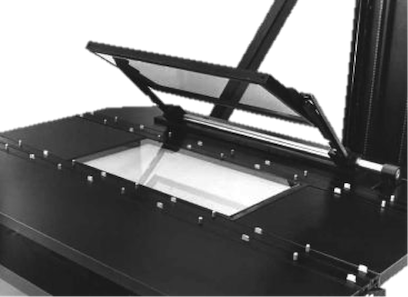 The table also includes an integral sixteen field neon backlight and air operated platen. 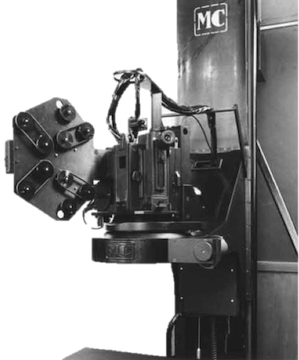 The table rotates infinitely, limited only by the wrapping of the wires and because of the double telescoping North/South axis, the operator has free access to the table no mater where it is in its range of travel. Standard system (shown right) includes: Main column approximately 11' 7" tall (in order to stand in a room with a twelve foot high ceiling), our standard north/south & east/west compound which gives approximately 48" of east/west and 28" of north/south travel. Also included is a standard camera carriage, motorized follow focus base, motorized rack over, capping shutter, a standard lens mount and the mounting of your camera box to the system. 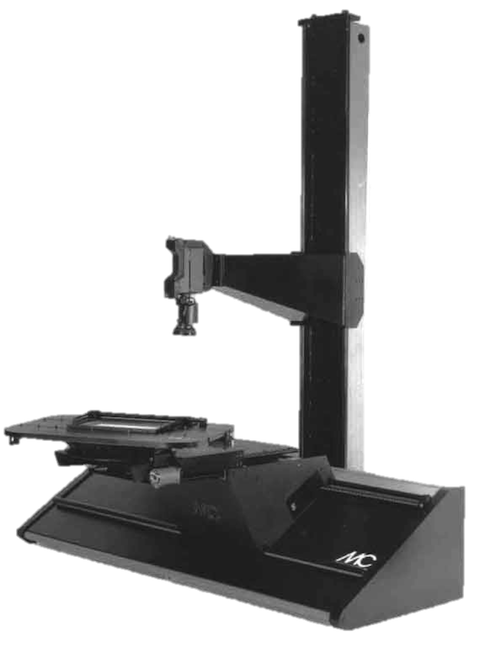 Mechanical details of double telescoping North/South axis and table rotation. Our proprietary moving peg bars have ball bearing slides and are without play in any direction. The bars can be removed from the table simply by removing two screws at each end of the track. The bars come out with the drive and motor still intact and attached. The shape of the pan bar track allows multiple tracks to be stacked against one another and provide a multi-field table. The one pictured is both twelve and sixteen field formats. When the twelve field bars are removed, an oversize sixteen field area is exposed and a new sixteen field mask drops into the opening left by the removal of the twelve field bars.